The Turkish Foreign Ministry has summoned Iranian Ambassador to Turkey Alireza Bigdeli over statements from Iranian officials criticizing Ankara’s policies on Syria and blocking aid to Kobane, Hurriyet Daily News reported today. “Turkey does not need to ask permission from anyone while taking measures in line with international law against threats to its national security,” said Tanju Bilgic, spokesperson for Turkish foreign ministry. “Turkey denounces remarks by Iranian officials, who should remain silent out of shame over the situation in Kobane and the humanitarian tragedy in the region as Iran supported the Syrian regime that is the main cause of the terror problem,” Anadolu News Agency quoted Bilgic as saying. Iranian Chief of General Staff General Hassan Firuzabadi had criticized Turkey for blocking aid to Kobane; while Iranian Deputy Foreign Minister Amir Abdollahian had accused Turkey of pursuing “neo-Ottomanist” policies in the region. Iranian forces and their allied Shia militias in Syria have not come to the aide of the Kurdish fighters in Kobane. 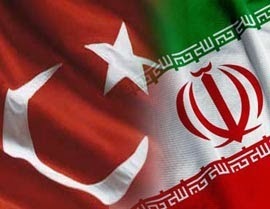 Turkey and Iran is engaged in a tug-of-war...competing over influence, herding proxies, funding terrorism etc etc. However military conflict is brewing between these two rising nations. In the not so distant future these two main actors of the region will fight it out. One will stand as the Victor, if nothing else then at least in a military sense. The other will be military defeated, resulting in much less influence and power projection in the Middle East. "Iranian forces and their allied Shia militias in Syria have not come to the aide of the Kurdish fighters in Kobane." Kobane is only a few kilometers from the Turkish border, where currently Turkish Army M48 tanks sit idle. The nearest Iranian-allied military positions are roughly 150 kilometers away from Kobane, separated by hostile held territory. The Iranians are saying that the Turks were not helping Kobane, that was the subject of the post, and the Turks are responding that Iranians are not doing anything either. Both are right. Neither Iran or Turkey are doing anything to help the embattled Kurds in Kobane, although both have armed forces and allies either right on the border or in the country. Iranian forces do not have to cross 150 km hostile terrain to reach Kobane. If they want to do so, their special forces could reach Kobane through many routes, including Iraqi Kurdistan. Let's not make excuses for them when the Iranians themselves do not make such excuses. Kobane was a strategic blunder for ISIL. These insurgents can occupy cities like Mosul easily where segments of local population are sympathetic to their cause. They have a tough time occupying cities with hostile inhabitants. Turkey and Iran also made strategic mistakes in not aiding YPG in their fight against ISIL. Major blunders. Kobane is becoming another Stalingrad. Why? Turkey has been the loser thus far in the debacle. They have alienated themselves from Syria, Iran and Russia, resparked tensions with the Kurds and are now known globally to have semi-warm relations with IS. Erdogan is making himself to look like more the Islamist autocrat with every passing day, allowing for safe passage of IS militants through Turkey and jailing journalists and political activists. What has Turkey won?
" They have alienated themselves from Syria, Iran and Russia..."
this is a good thing. Syria, Iran and Russia are led by vile authoritarian regimes and are to isolated sinkholes and a very weak and discredited Russia. Turkey's economy is strong and it will continue to bid for great influence in the Middle East as it seeks to market its manufactured goods throughout the area. They've got "permission" to fund and direct operations of thousands of militias in Syria and Iraq, why not in Kobane? are you saying that Assad would not give the Quds Force the permission it needs? Are you kidding me? Agreed. That's been my argument: Iran's priority in Syria has been leading the fight against the opposition in defense of Assad's regime; and not fighting ISIL in defense of Kobane, the Kurds or other people of Syria. very easy to annoys other regional aspirants when you start to assert your own muscle. Turkey's "economy" depends on handouts from Arab countries in the Persian Gulf...Once they stop their funding, everything collapses in Turkey.. Read a bit more on Turkey's deficit and you'll understand before making silly comments... The Gulf Arabs have the Turks by their balls..Which is why they do everything they're told to do...Beggars can't be choosers!! !